A conditioning combination of nourishing oils including sunflower seed oil and safflower oil to moisturize facial hair and skin. This MARLOWE. 3oz (travel-compliant) Beard Oil is the best value for your money. Here are seven reasons why you need beard oil in your life: Beardruff/Beard Itch: Your beard is similar to your scalp. If you do not give it the proper nutrients through moisturizing, then it will lead to dry, itchy, flakey skin. Hydrating and Conditioning: The beard oil will lead to shinier and smoother beard hairs from root to tip which will make your beard look and feel so much better. Styling Agent: A two-in-one product is the simplest way to achieve your goals. Conditioning while styling could not be easier. Soften and Tame Beard Hair: No one wants unruly facial hair. An un-kept beard will make you look messier, and not in a good way. Keep Your Beard Clean: No matter the size of your beard, it's always necessary to keep it clean. The oil helps wash away dead skin cells to keep your beard clean while preventing and eliminating the dreaded beard itch. Say Goodbye to Split-Ends: Applying oils to your facial hair will reduce the likelihood of split-ends. This makes your life easier by lessening the amount of times you need to trim your beard. It's the best: If you want a healthier, fuller, and more manageable beard, It's the best thing you can use. These reasons show the benefits of beard oil and why it is a necessary step to grooming your facial hair. Your beard, and appearance will thank you for it. NO-NONSENSE BEARD OIL: A conditioning combination of man oil that moisturizes both beard and skin to stop itching and bring style & shine. MORE BANG FOR YOUR BUCK: Most other beard oils come in 1 oz or maybe 2 oz sizes. Our beard oil will last you 3X longer at a better price, while complying with travel & TSA standards. 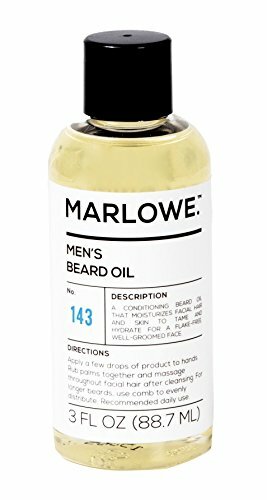 EXPERIENCE THE MARLOWE DIFFERENCE: Made with only four completely natural oils which tame straggly hair and hydrate for a flake-free, well-groomed face. NO BAD STUFF & MADE HERE: Paraben and phthalate-free, not tested on animals, and made in the USA. If you have any questions about this product by Marlowe, contact us by completing and submitting the form below. If you are looking for a specif part number, please include it with your message.